On a floured surface, lowly and gently unroll crust. Place crust in an ungreased 9-inch glass pie plate and press firmly against the side and bottom. With a fork, prick bottom and sides of crust. Bake 10-12 minutes or until golden brown. Set aside and let cool. In a large mixing bowl, mix avocados, cream cheese, sweetened condensed milk, lime juice and salt until smooth. Pour into pie crust and place a piece of plastic wrap on surface of avocado filling. Refrigerate for 4 hours or overnight. Top with whipped topping and lime zest. After serving, return any leftover pie to the refrigerator. Avocado is one of my favorite fruits to use for cooking. It’s an essential ingredient in my sandwiches and great in my salads, but lately I’ve been adding them to my desserts too. 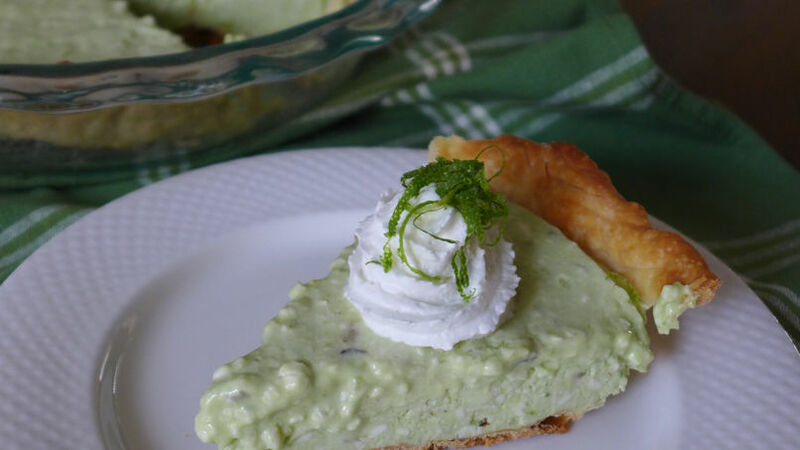 Because avocado becomes smooth when whipped, it’s a great base for chocolate pudding, smoothies and in this case, this decadent avocado lime pie. Made with Pillsbury Refrigerated Pie Crust, this sweet but interesting pie is quick to prepare and a great conversation piece when it’s time for dessert.